Here is another clothing calculator post, I posted the first one last week (click here to see the first post) and it went down really well. If you haven't seen the first one, then this series of posts is just going to be outfits I have put together from the new clothing/accessories online - from a range of UK online stores. It lets me be a bit creative and it shows you some of the new items online and how I would put them together. This post should have been up yesterday but I have been super busy with my dissertation - it is due in tomorrow! 1. Zara Star Print Blouse: LOVE THIS BLOUSE! I am not usually a blouse kind of girl (I only have one in my closet/wardrobe). But this blouse is just gorgeous, I love the star print and I love the sleeves - I am going to buy this online in the next few days (everyone needs a treat now and then...that's my excuse!). £25.99. 2. Topshop Milo Round Sunglasses, Black: I saw these a few days ago online and I instantly fell in love. I am going to go to Primark at the weekend to see if they have some like this but if not I will get these. £12. 3. Newlook Petite High Waisted Skinny Jeans: Newlook have started making petite clothing (finally) and some of the stuff looks great! I haven't bought anything from the range yet (well done Heather) but I will have to look at the clothing in store. I love the look of these high waisted skinny jeans, I think I own one pair of high waisted jeans - I think I need another pair. £22.99. 4. Topshop Alliance Harness Boots: now, I can't buy these as the smallest size they make is a UK 3 and I am quite tiny so I only have UK size 1/2 feet (gasp, I know). But these boots look so gorgeous and I think they would look great with this outfit. £85. 5. Topshop Edge Paint Satchel: LOVE this colbolt blue shade, I need more of it in my life and this bag is gorge! I love bags, satchels in particular, and it is perfect for spring/summer. Although it looks a bit too small for all of my stuff. £28. 6. Topshop Nail Polish 'Aurora': Gorgeous shade, it looks like polishes bought out by Chanel and OPI - you know the ones I'm talking about. Love the shade but I haven't had a good experience with topshop polishes. £6. I love your blog, maybe we could follow eachother? Let me know! That cobalt blue bag is awesome! What a fab colour!! I reallllly want those Newlook Petite High Waisted Skinny Jeans! I can't get enough of high waisted pants...they're perfect to wear with crop tops! The whole outfit looks very Mary Kate Olsen....I love it! Especially the black booties! my favorite piece is those glasses! Marvelous post! That bag is to die for! Reasonably priced too! The blouse is too cute. It's got a fun pattern on it but it is subtle enough to pair with other patterns and colors. Hi thank you so much for your comment on my blog. If you want we can follow each other? Let me know thanks! Love the nail polish!Those boots are to die for! Love that Topshop nail colour! love this post!!! I especially love that blue bag!! To die for! Wow, love the satchel and Topshop nail varnish! Such nice, deep colours! Great idea for a post! 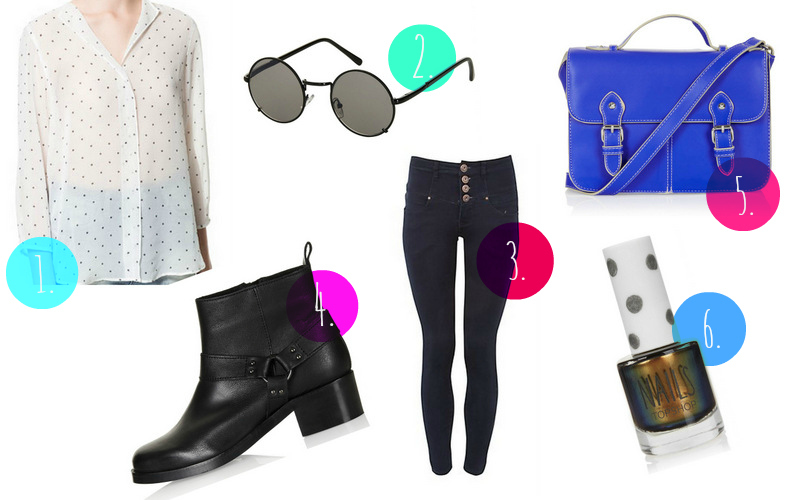 I love the cobalt blue bag, it will brighten up any outfit. Thanks for your visit...Happy Friday Doll! that bag is gorgeous omg! The boots are gorgeous! Love the satchel too!